01.10.2015 - Project page created. Traffic light detection from a moving vehicle is an important technology both for new safety driver assistance functions as well as for autonomous driving in the city. In this paper we present a machine learning framework for detection of traffic lights that can handle in real-time both day and night situations in a unified manner. A semantic segmentation method is employed to generate traffic light candidates, which are then confirmed and classified by a geometric and color features based classifier. Temporal consistency is enforced by using a tracking by detection method. We evaluate our method on a publicly available dataset recorded at daytime in order to compare to existing methods and we show similar performance. We also present an evaluation on two additional datasets containing more than 50 intersections with multiple traffic lights recorded both at day and during nighttime and we show that our method performs consistently in those situations. 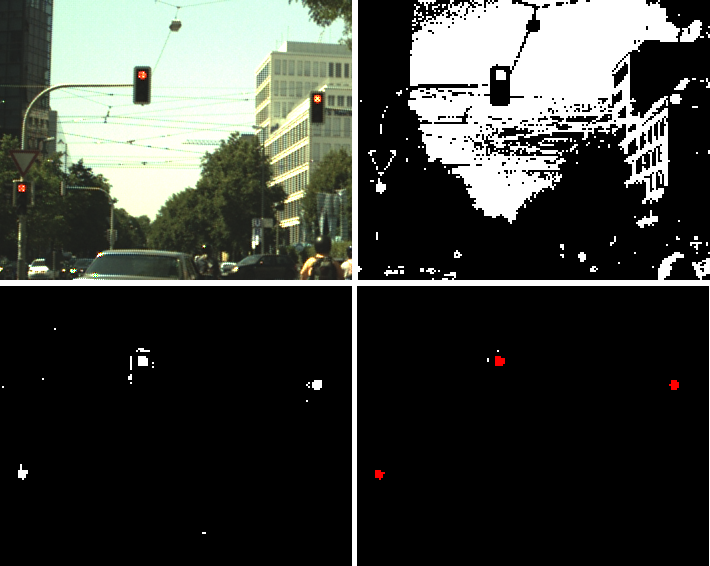 Semantic segmentation based traffic light detection at day and at night.